When it comes to culture, the 1920’s is my favorite bygone era. Most of the things born in that period signify change and youth. Women donned short hair and wore shorter skirts. They smoked and drank openly while wearing their low-heeled Mary Janes and doing the Charleston step. Prohibition didn’t stop these free-spirited people from drinking. I give thanks to those rebels who came before me and gave birth to the Speakeasy culture. Also significant is the increased visibility of black culture found in emergence of jazz, blues and the Harlem renaissance. In design, geometric shapes combined with sumptuous materials like chrome, glass and velvet make the art deco movement as bold as it was feminine. In short, the 20’s were glamorous, sophisticated and progressive. My love for that era drove me to take Lindy Hop lessons, listen to Louise, Duke and Ella, collect vintage clothing and dream of going on the Orient-Express. I finally followed that dream and boarded the midnight-blue Venice Simplon-Orient-Express this year. I have always found the idea of train travelling romantic. It’s no wonder why some of my favorite movies revolve around trains. I watched the Darjeeling Express eight times and Before Sunrise five times. 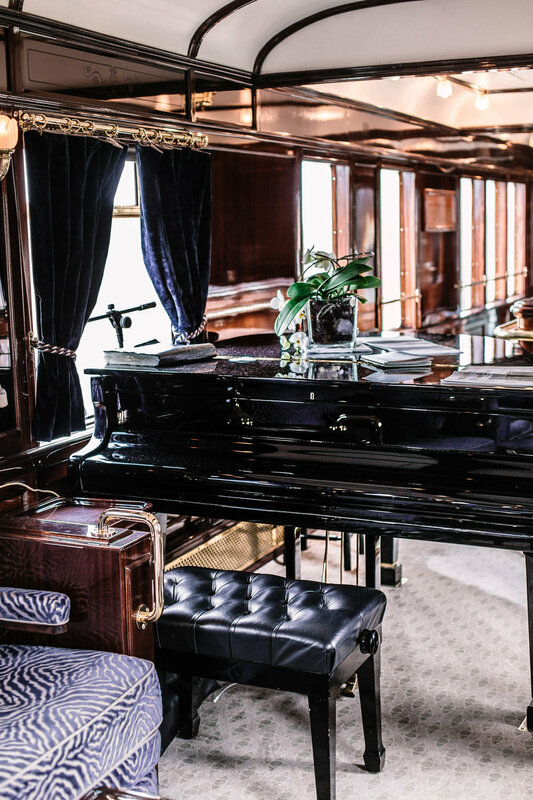 The Venice Simplon-Orient-Express was my very own romantic train story. Everything was exactly as I imagined and more. The original cars from the 20’s were renovated to preserve the integrity of the art deco design. 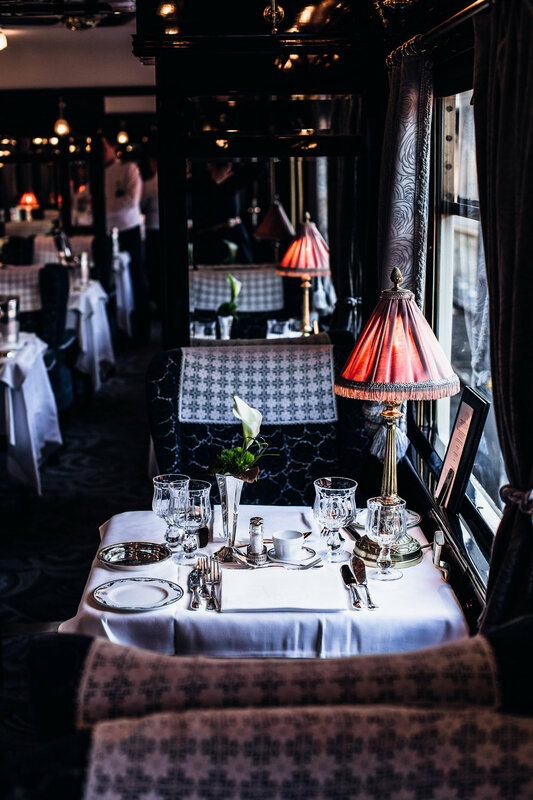 The train has three dining cars - Etoile du Nord, Côte d'Azur and L' Oriental - each with its own unique design. A bar car dubbed ‘no. 3674’ and the dining cars are situated in the middle with sleeping coaches to either side. The design of these cars is definitely the main attraction of this fabled train journey. As we journeyed across Italy, Austria, Liechtenstein, Switzerland and France, the train took on board fresh ingredients to prepare delicious meals for us. Lobsters from Brittany, for example, was put on board in the morning of the second day during our 40-minute stop at Gard de Nord. Our cabin was in car no. 3552. It was compact yet felt very spacious. By day, the cabin has a long sofa seat upholstered with beautiful fabric. The cabin came with a stool making it easy for me and Derrek to sit and have a face-to-face conversation over tea and breakfast. The washbasin is disguised behind a lacquered wood enclosure in the corner of the cabin and is filled with a tantalising selection of skincare products. By night, while we were having dinner, the cabin was discreetly turned into an inviting bedroom with upper and lower bunk beds. The beds were wrapped in crisp, pale pink damask sheets which looked cozy and romantic in the dimly-lit light. Dinner and cocktails were definitely one of the highlights of our trip. It was fun to dress up, plus Derrek and I clean up ok. In the bar car, we listened to oldies from the baby grand and watched the soft glow of the small villages, nuzzled among snow-capped mountains, drift into the distance as we passed. There was certainly something magical about the train that sparked an extra sense of romance. Or perhaps it was the cocktails. Everything about the Venice Simplon-Orient-Express was a dream from which I didn’t want to wake up. I wish it went on forever. 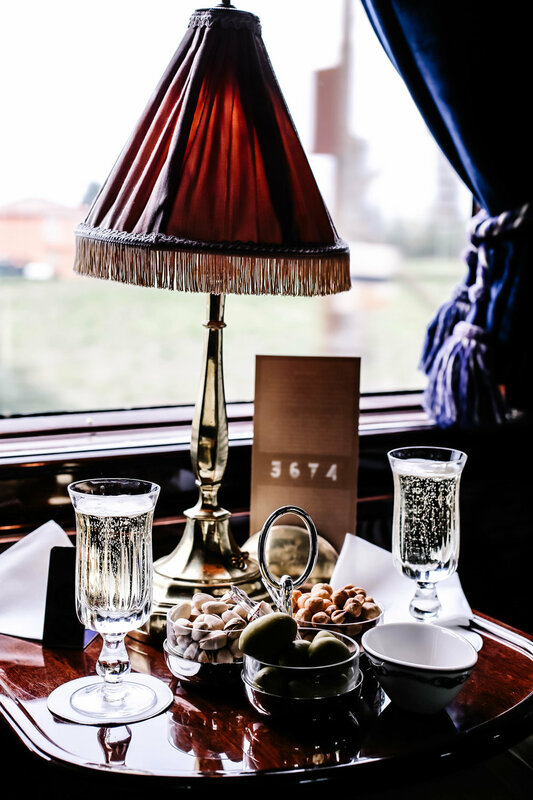 For the two days of our journey from Venice to London, the train functioned as a time machine that took us back in time to the 20s. I got a glimpse of what it would be like to travel back then. I realise I’m extremely lucky and privileged to have this experience and to be able to write this post. And I'm grateful for it. Since I was a little girl, I have always dreamt of going somewhere. Anywhere. The whole experience on the Orient Express reminded me that sometimes the journey is the destination.